He is one of the most legendary golfers of all time and after more than three decades, Australian Greg Norman is still driving the ball down the fairway. Greg Norman is your Connector of the Day. Norman was born in Queensland, Australia in 1955 and didn't even start playing golf until he was 16 years old. However, within a year of learning to play, Norman quickly had a scratch handicap. His professional career began in 1976 and in that same year he won the West Lakes Classic at The Grange in Adelaide, South Australia. In less than five years, Norman won the Australian Open and soon after it was the start of a long career of impressive wins around the world. During the 1980s and 1990s, Norman spent a record-breaking 331 weeks as the world's number one golf player. Norman soon developed quite the reputation on the fairways and other golfers and commentators began dubbing him the "great white shark" - both a reference to his aggressive and tactical style of play and his bright blonde hair. 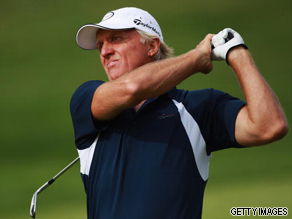 Here's your chance to have your questions answered by champion golfer, Greg Norman. Do you want to know what his toughest tournament has been? Maybe you want to know what he thinks of Tiger Woods? Do you need any tips on your game? Did you experiment with different grips before your mesh grip – what pros and cons do you see as compared to the interlocking grip? and would you recommend your grip to the club golfer? Greg, did you waste your life hitting a small ball into a hole? Glad to see your return to competitive golf this past weekend. Will you be continuing to play more tournaments this year ? I am a big fan of Greg Norman the golfer but I have also heard great things about Greg Norman the entrepeneur. Would you have any advise for someone young that wants to be a success in the business world? Many years ago, you won a tournament in Seattle, Washington and one of the awards was a putter made in Alaska, the 'Polaris Putter' which I designed and had manufactured in Alaska. I've been meaning to write you for some time wondering if you still have it. Greg – I once asked for your autograph and you laughed me off. Perhaps you'd be willing to send me one now? Greg, you are an inspiration to many, and I followed with great interest your effort in the 2008 Open. My question concerns mature golfers – what types of exercises routine and diet do you have to stay healthy and fit, and what pre-game warmup and post-game stretching do you do? What can you tell me about your GNGCD Paiva golf course project in Recife, Pernambuco, Brazil? What will the course be like? What was the turning point in your life with regards to golf...For example, was there a particular event or moment where you realized that you could be successful in playing golf professionally, and compete against the best players in the world? 1996 Masters disaster – was that just a bad luck golfing day, a mental breakdown or something else? Are you following the football finals in Australia? Who are you barracking for in the AFL and NRL finals series? You've had your own set of personal problems in the public eye... I'd like to know what you think of Tiger Woods and how his image has been tattered by the affair. What does his future hold? how have you battled both your public life and private life together? ie ur public divorce and also playing golf. Do you that the folfing world, with its money and sponsorships encourages a kind of god-like persona amongst many of the players where they think they can do whatever they want. Much like tiger? What's the best shot (of 4 or 5 shots) you ever hit in tournament golf? Don't let time pass you by, please play the Champions Tour!!! In what way has Tiger Woods improve the golfworld? In what way are gaming softwares improving the golfworld? I am looking forward to hearfrom you soon.